Keith Rogers, Kentucky Department of Agriculture’s Chief of Staff, spoke to KSBA members about the Kentucky Proud program at our business meeting in June. Some of the members raised concerns about the ability of people to buy honey from outside of Kentucky, bottle it here, and sell it as Kentucky Proud because it was processed (bottled) in the state. The discussions turned to what it would take to create a Certified Kentucky Honey label and a subcommittee was formed to pursue the idea. The subcommittee met in Elizabethtown on July 17. Several ideas and concerns were discussed. One of the first ideas was to do something similar to what Wisconsin has done for their Wisconsin Certified Honey label. Wisconsin’s program requires the producer to submit an application form, a $50 application fee, and the lab results from a Stable Carbon Isotope Ratio analysis showing the honey was produced in-state. Once accepted, the application is good until the next odd-numbered year. The lab analysis is done by labs not affiliated with the Wisconsin Department of Agriculture and typically costs around $250 per analysis. There was concern that the analysis required for Wisconsin’s certification would be cost prohibitive to Kentucky’s small, backyard beekeepers. This led to a discussion about whether the label should be tailored for all Kentucky beekeepers or just the commercial beekeepers because most of the backyard beekeepers have little problem selling their honey. The major concern with this idea is that it would leave out most of Kentucky’s beekeepers. If backyard beekeepers aren’t included, then there will be so much local, non-certified honey available that a Certified Kentucky Honey label would lose any potential value. A multi-tiered certification program was suggested as one possible solution that would allow small and large beekeepers to participate in the program. It was also pointed out that pollen analysis is typically much cheaper (around $80) than Stable Carbon Isotope Ratio analysis. Although it isn’t as location specific, pollen analysis may be a more economical option. Ag Development and USDA Specialty Crop grants were discussed as ways to help offset analysis costs to the beekeepers. In order for a Certified Kentucky Honey label to be successful, everyone agreed there would need to be significant amounts of marketing and consumer education to help retail businesses and the public understand what the new label meant and its value. 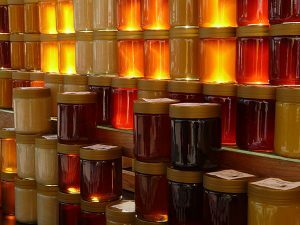 While there are many relatively fast and free ways to get the word out about a Certified Kentucky Honey label, the effort would need to be sustained and intensive throughout the state. The amount of time needed to do that level of marketing and education would be more than what could be done on a volunteer basis. Another possible use of any grant funds could be to help KSBA hire someone to oversee the program, including the marketing and consumer education. Shannon Trimboli volunteered to create and send out a survey in order to gain a better idea of what Kentucky beekeepers want in regards to a Certified Kentucky Honey label. The survey can be found on the KSBA website (http://www.ksbabeekeeping.org/do-we-need-a-certified-kentucky-honey-label/). It was also posted to the KSBA Facebook page and sent to everyone who is signed up to receive KSBA news posts. A second email was sent to any email addresses listed in the table of local organizations on the KSBA website and the local organization contacts were asked to share the survey with their members. The survey is designed to gage beekeepers’ interest and to find out how they would like to see the program function if the label was created. Those answers can then be used to outline and design a program that works for everyone. Trimboli also created a second survey to begin assessing consumer interest in a Certified Kentucky Honey label. That survey is also available on the KSBA website (http://www.ksbabeekeeping.org/certified-ky-honey-label-consumer-survey/) and on the KSBA Facebook page so anyone can share it. Everyone who received the emails mentioned above were also given the link to the consumer survey and asked to share it with anyone they know who buys honey. The subcommittee is also looking into the logistics of having the survey available for consumers to take at the Honey Booth and having fliers with the link available to put in customers’ bags. The next meeting of the subcommittee is scheduled for Tuesday, Aug. 22 at 1:00 ET at the State Fair. The meeting will be open to anyone who wants to attend. Anyone planning to attend is asked to RSVP to Tammy Potter (tammy.potter@ky.gov) by Aug. 10 so the right sized room can be reserved.